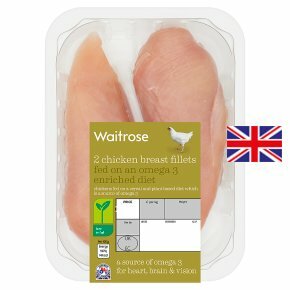 Omega 3 enriched British chicken - available exclusively at Waitrose. Waitrose boneless and skinless British chicken breast fillets, naturally enriched with Omega 3. Our British chickens are fed on a diet enriched with Omega 3, resulting in the same delicious, lean and versatile meat with additional health benefits which are passed on to you. Omega 3 essential fatty acids help to maintain normal functioning of the heart, brain and vision as part of a healthy, balanced diet and lifestyle. All our chickens are raised with care on British farms, by farmers who share our values.